M.J. (Dennis) van de Kamp, 83, passed away on Sunday, September 9, 2018 in Arlington peacefully at home in his sleep surrounded by his wife and his dog, Sadie. Funeral: 3:00 p.m. Friday, September 14, at Wade Family Funeral Home, 4140 West Pioneer Parkway, Arlington. Visitation: 6:00 - 8:00 p.m. Thursday, September 13, at the funeral home. Memorials: In lieu of flowers, if you wish, please make a gift to the American Lung Association in his name. Dennis was born on November 11, 1934 in Paris, France. His father was transferred to the states when he was 6 years old. He worked for IBM from 1965 to his retirement in 1993. He married the love of his life, Mary, in Boulder, Colorado in 1967. The company transferred them to several locations, before ending up in Arlington in 1980. They made their home in Interlochen, a wonderful neighborhood with loving friends they have had for 38 years. He was preceded in death by his parents and sister, Nell Rutten. Survivors: Wife, Mary van de Kamp; daughter and son-in-law, Cynthia and Walter Welle; brother, Bill van de Kamp; brother and sister-in-law, Ted and Pat van de Kamp; sister and brother-in-law, Josie and Mike Kaczmar; and many family and friends. 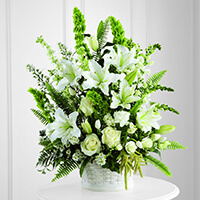 To send flowers to the family of Martin John van de Kamp, please visit our Heartfelt Sympathies Store. Inurnment in the Columbarium at Dallas Fort Worth National Cemetery will be at 11:00 a.m.
With much love and the fondest of memories.